68" wide and 18" deep. 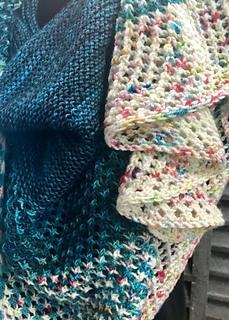 Domino Doublet was designed by Mira Cole for Amazing Threads for our 2019 MN Yarn Shop Hop. Mira dyed 3 exclusive colorways for Amazing Threads and this project: Pips, Domino Effect, & Chain Reaction all in Baah LaJolla. 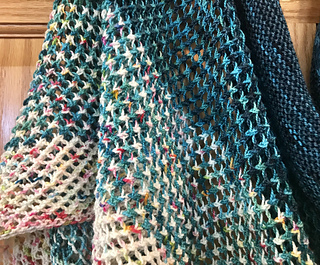 The shawl uses all 3 colors. 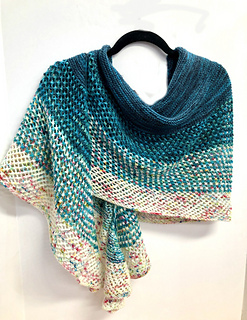 This is a simple knit that produces a stunning shawl. Inspired by the Baja Beach Sunsets with a Margarita in hand. Relaxing by the pool. On vacation. Yarn paradise. You have the beach. You have the Yarn. Gauge is not important unless you are a tight or loose knitter. If you always knit up or down a needle follow that rule for this project. Dimensions after blocking: 68” wide and 18” deep.